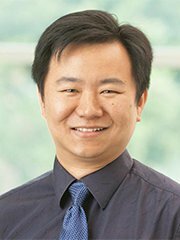 UNMC › Radiation Oncology › Faculty › Chi (Kevin) Zhang, M.D., Ph.D. Brain and Central Nervous System (CNS) cancer including glioblastoma (GBM), anaplastic astrocytoma/oligodendroglioma, low grade glioma, brain/spine metastasis, and benign CNS tumors including meningioma, schwannoma, pituitary adenoma, etc., lung cancer, sarcoma, and melanoma. Provide radiation therapy with intensity-modulated radiation therapy (IMRT), stereotactic body radiation therapy (SBRT) particularly for lung cancer, radiosurgery (SRS) for brain and spine tumors, trigeminal neuralgia and arteriovenous malformation (AVM) using frameless or frame-based approaches. Cancer markers in brain tumors focusing on glioblastoma in patients with translational research in animal models. Novel drug delivery system using nanoparticles. Project 1: To test the hypothesis that androgen receptor (AR) is a novel target for treating GBM. Most of the GBM tumors are diffusely infiltrative so that achieving gross tumor resection (GTR) is challenging in majority of the cases. Tumor recurrence/progression/lethality is essentially universal even after GTR. Radiation therapy thus plays a major role in treating this disease. GBM cancer stem cells (CSCs) have been proposed to be responsible for the radioresistance. It is necessary to identify novel therapeutic agent(s) that can pass blood-brain barrier (BBB) and enhance radiation effects. Androgen receptor (AR) has been reported to be associated with CSCs in prostate cancer. Androgen deprivation therapy has been practiced for decades on prostate cancer patients that enhances radiation effects. A newer generation of drug that inhibits androgen receptor (AR), enzalutamide, is available for prostate cancer treatment and able to pass BBB. However, the expression pattern of AR and functions of AR in GBM tumorigenesis has not been well studied although there are limited reports showing that it is overexpressed in GBM. Our preliminary data also support that AR could be a novel target for GBM treatment. We thus propose to further study AR expression pattern in our patients’ tumor samples aiming to develop a scoring system for the intensity and pattern of AR expression in GBM, with the assistance of our in-house pathologists, Dr. Rodney McComb and Dr. Michael Punsoni. Studies of AR expression at mRNA and protein levels and the potential tumor inhibitory effects of available drugs that target AR, particularly enzalutamide, will be carried out on GBM cell lines. The data from our translational research in cells and in animal models will support future effort to conduct clinical trials for patients with recurrent and/or primary diagnosed GBM using enzalutamide. Project 2: To test a cell mediated drug delivery system to CNS combining brain irradiation, nanoparticles and macrophage. We are also testing the possibility of using circulating monocyte/macrophage as a vehicle to deliver radiosensitizing drugs into brain combining nanotechnology for drug loading into the cell vehicle and stereotactic radiation therapy to focal brain tissues for inducing CNS inflammation for chemotaxis attracting immune cells to infiltrate to certain area of the brain such as the tumor. I am also conducting clinical studies on radiation therapy for brain tumors, benign or malignant, as well as lung/breast/prostate cancers. Project 3: To test the immune effects of metformin in treating GBM. My laboratory is also conducting research on testing medications which were FDA-approved initially treating benign medical conditions or other types of cancer for their potential secondary use on treating GBM. We have conducted research on and confirmed the anti-tumor effects of metformin, a medication commonly prescribed for type II diabetic patients in treating GBM in vitro, with and without combination with other candidate drugs that can pass blood-brain barrier. We are now expanding the study on metformin to further explore the potential function of this drug to confirm whether its known role of converting subtypes of macrophage from M2 (pro-tumor) to M1 (anti-tumor) could be applied in treating GBM by enhancing the immunotherapy effects from PD-1/PD-L1 inhibitors. The same study will be conducted in pancreatic cancer model collaborating with Dr. Chi Lin, a radiation oncologist at our department. High concentrations of metformin treated macrophage in vitro will be injected to mice carrying an orthotopic implanted GBM with/without brain RT and/or PD-L1 inhibitors for the tumor response and survivals of the animals. Zhang. C., S.X. Yan, J.Wu, and T.K. Hei. Combination of Metformin and a Dual mTOR Inhibitor Shows Enhanced Inhibitory Effects on Cell Proliferation of Glioblastoma Cells. Int J Radiat Oncol Biol Phys; 93(3), Supplement, Page E523, 2015. Shonka N., and C. Zhang (corresponding author). Searching for Synergy: Combining Drugs and Stereotactic Radiosurgery for the Treatment of Brain Metastases. Commentary accepted by Journal of Oncology Practice, 2016. Baine M., N. Shonka and C. Zhang (corresponding author). Combining Radiation Therapy with Systemic Targeted Therapies in Intracranial Metastatic Disease. Journal of Systems and Integrative Neuroscience (JSIN), DOI: 10.15761/JSIN.1000140. Wang S., D. Zheng, C. Zhang, R. Ma, N. R. Bennion, Y. Lei, X. Zhu , C. A. Enke, and S. Zhou Automatic planning on hippocampal avoidance whole-brain radiotherapy. Medical Dosimetry, Feb. 2017, 42(1), 63-68. Zhang, C. Enhanced Tumor Inhibitory Effects by Combining Metformin with Rosiglitazone in Glioblastoma Cells. IJROBP 99 (2), S188-189, 2017. Du, Q., C. Zhang, X. Liang, C. Zhang, V. Verma, K. Follett, S. Wang, Q. Fan, R. Ma, S. Zhou and D. Zheng. Impacts of anatomical features on dosimetry and outcome of trigeminal neuralgia stereotactic radiosurgery. Accepted by Medical Physics, 2018. An, C., C. Zhang and B. Xu. Pathologic Study of Tumor Extension for Clinically Localized Unilateral Nasopharyngeal carcinoma. Submitted, 2018. Hill, T.K., V. Verma, M. Alam, E. R. Lyden, and C. Zhang (corresponding author). Patterns of Care in Pediatric Craniopharyngioma: Outcomes Following Definitive Radiotherapy. Submitted to Am J Clin Oncol. 2018. Baine M., A. Drincic, N. Shonka, W. Thorell and C. Zhang (corresponding author). A case report of a silent ACTH-positive pituitary adenocarcinoma that metastasized extra cranially after stereotactic radiosurgery twice. In preparation, 2018. Ryckman J.M., V. Ganesan­­­, V. Verma­ and C. Zhang (corresponding author). National Practice Patterns of Proton versus Photon Therapy in the Treatment of Adult Patients with Primary Brain Tumors. Submitting to IJROBP. Ryckman J.M., A. K. Appiah, C. Zhang and V. Verma. Timing and Sequence of Chemoradiation for Low-Grade Gliomas Meeting RTOG 9802 Criteria, In preparation. Zhang, C. and M. Baine Central nervous system tumors. Chapter 10. In book: Radiation Oncology: Management Decisions (Ed. K. S. Clifford Chao, Carlos A. Perez, Luther W. Brady, second edition). In publication, 2018. Zhang, C. and T. K. Yanagihara Lung. Chapter 22. In book: Radiation Oncology: Management Decisions (Ed. Ed. K. S. Clifford Chao, Carlos A. Perez, Luther W. Brady, second edition). In publication, 2018. Project Title: Small animal MRI brain imaging studies: Monocyte-mediated Radiosensitizer Delivery to Brain Tumor with Concurrent Brain Radiation Therapy (RT) Using Glioblastoma (GBM) Mouse Model.